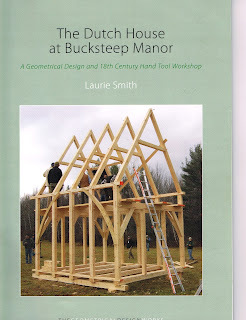 Laurie Smith's book, The Dutch House at Bucksteep Manor, A Geometric Design and 18th Century Hand Tool Workshop covers the workshop he gave in Massachusetts in 2009 for the Timber Framers Guild. Laurie Smith is a timber framer, historian, and researcher of the use of geometric design in medieval England. Laurie Smith begins with analysis of the geometry used to design and frame 6 colonial Dutch houses in the Hudson River valley of New York. That understanding, based on measured drawings, became the basis for the frame built at the workshop. Following the workshop Laurie Smith spoke at TFG's Eastern Conference in Saratoga Springs, NY. The frame of the Dutch house had been erected in the hotel auditorium, but Laurie did not refer directly to it, the course, or the research he had done to prepare. Instead he spoke about his work in England and Wales. It was fascinating. I attended the conference specifically for his talk as I had read his articles in Timber Framing, the TFG journal. Later we began to correspond by e-mail. Our latest conversations have been about the Old First Church and the Luykas Van Alen House, both of which I have written about in this blog. The drawings in the book of the regulating lines, the circle geometry of the 6 houses are clear and beautiful. For me they are a tutorial. The measured drawings are also a gift. I am very familiar with colonial houses in eastern New England where I spent most of my life. I do not know as well the Dutch framing used in these 6 houses. It is similar to what I see in the part of the Hudson River watershed where I live today. Drawings such as these are not easy to come by, so I am reading them carefully. My thanks to Jack Sobon for the documentation.